“This soup is delicious!” –Claire Fraser. Episode 311, Uncharted, opens on a sea turtle, and what a lovely gift for Outlander readers as it no doubt foreshadowed one of the most highly anticipated scenes from Voyager (we’ll get to that). I don’t know that Uncharted was the best title. It’s too easy to forget about Young Ian. Picking up where we left off from last week, Claire (Caitriona Balfe) wakes on her barrels and makes it to shore, where for a substantial portion of the opening, we watch her survive. There is almost no audio, music or narration. It is a nice “addition” to her desolation. Yes, she’s in a foreign land, but we’ve been here before. She was also surviving in a foreign time/land for the entirety of season one. So not totally uncharted territory here. Also, from the look of things, namely the lush greenery and wildlife, I imagine rural survival in the West Indies was substantially easier than in the frozen Scottish highlands. After a few close calls with fire ants and one hell of a python, Claire finds herself in the care of an ornery but wise matron Mamacita (Victoria Leporia), her eccentric but well-meaning son-in-law Father Fogden (Nick Fletcher), and his buddy Cocoa (no actor named) … a cocoanut. After sharing her mission to find her husband with Fogden, he reciprocates with the story of how he and Mamacita came to be on the island. He and his now deceased wife Ermenegilda fled the Cuban invasion with her mother. This interaction between him and Claire is a critical book moment because now they relate to one another and a bond forms, in spite of his peculiarities. He just might come in handy later. Later, as Claire attempts to persuade Fogden and said cocoanut to leave for the nearest port ASAP, they’re interrupted by a screaming Mamacita. She’s carrying a skinned goat head. A band of no-good sailors in need of sustenance pinched one of their goats. She mentions something about “a Chinaman.” Claire perks up at this. Mr. Willoughby (Gary Young)? If so, she’s referring to the crew of the Artemis. Jamie (Sam Heughan) could be right under her nose! But before Claire can draw out the location of the sailors, Fogden must first finish what the hungry crew started; he places the goat head on a slab and covers it in carrion beetles (I think?) to clean the bones, thus introducing the second key plot point from the novel. Fogden acquired the beetles from a sacred cave, revered by the natives called Abandawe. If this sounds familiar, that’s because we first heard of the cave in episode 307, “Crème de Menthe.” Sickly Margaret Campbell, a brief patient of Claire’s, incoherently muttered something of it. And, she and her brother Archibald were preparing for a journey to Jamaica. I’ll leave that here for now. Finally, Mamacita points toward the beach, and Claire takes off, frantic to find Jamie. Meanwhile, back on the beach, Jamie and Fergus (Cesar Domboy) give us some backstory. We learn the captain is dead and the ship’s mast is damaged. The ship itself will be fine, but poor Fergus is having impure thoughts. Jamie gives him some fatherly advice. With the mast repaired, the crew heads back to the Artemis to set up and weigh anchor. Claire frantically makes it to the beach before the ship departs but not unscathed, having gashed her arm. Screaming and desperate to grab the crew’s attention, she holds up a mirror glass she found earlier, using it to reflect the sun. The glint catches Jamie’s eye, who then spots her through his spyglass. With Claire now safely reacquainted with her party, she becomes the patient and Mr. Willoughby carefully stiches up the open wound on her arm. This for me would be the only moment of uncharted territory. Jamie brings her up to speed that in spite of the Captain’s death, he is still a wanted man, and also he has since blessed Fergus and Marsali’s (Lauren Lyle) marriage. In fact, he says, a wedding would lift everyone’s spirits. But where are they going to find a holy man with a quirky disposition?! Claire knows just the man, but first Mr. Willoughby has some business to attend to. After he apologizes for the goat with the offering of a rooster, Father Fogden agrees to oversee the union. Claire helps Marsali prepare for her wedding night, and the two soften on one another. It’s here we get to story element three: Who is Fergus? With a hilarious wedding sequence well underway, Father Fogden asks Fergus for his full name. “Fergus,” he replies. It occurs to all that he has no surname. Fogden claims he cannot complete the union without a full name. This is one of the few moments from the books that made me cry. Jamie claims Fergus as his own, as his son. What started off so many years ago as a “business arrangement,” it has since forged into family. With Voyager being as robust as it is, the writers have had cut quite a substantial chunk of source material from the adaptation. I was thrilled this made it in. With the newlyweds off and married, Jamie and Claire adjourn to their cabin aboard the ship. Nothing like a wedding—and some sherry-laden turtle soup—to make a gal feel amorous. Claire is behaving “funny.” She is fevered from her wound and drunk on the soup. But not to worry, she is a doctor after all and pulls out her bag of 20th-century penicillin. Unable to dose herself up alone, Jamie assists with everything save the injection part. (Funny, all things considered.) And though he’s concerned for her wellbeing, he can’t help but be amused—and aroused—by her. I’d go into further detail but readers know what happens from here, and viewers well. You know now too. Like in so many episodes this season, a lot happened in Uncharted. And, this was a longer episode clocking in at over one hour and five minutes. And you know what else? I COMPLETELY FORGOT ABOUT YOUNG IAN. Until Jamie mentioned it to Claire on the beach, the poor kidnapped toe-head was out of sight and out of mind for me! And I’ve read the book! I am enjoying this season, but there’s far too much to keep track of and not enough time. Books don’t have time constraints, but I just wonder if certain segments that landed on the writers’/cutting room floor may better serve the narrative overall. Two episodes left, and still so much to cover. Burn that bum roll, girlfriend! #LEANIN! What was with the wrapping of the legs after the fire ants? Would that work? THAT SNAKE. It was just a python, but still ALL THE NOPES. Props to hair and make-up. Claire’s sunburn and wiry greys look great. I was so over nature by the time the beetles appeared. 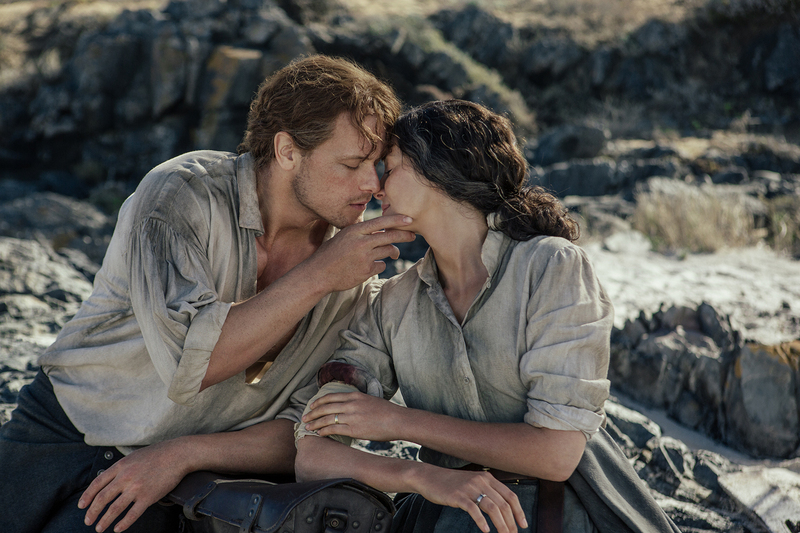 This entry was posted in Caitriona Balfe, César Domboy, Charlotte Brandstorm, Episode Reviews/Recaps, Gary Young, Karen Campbell, Lauren Lyle, Production Photos, Sam Heughan, Shannon Goss, TV Show Clips and tagged Caitriona Balfe, César Domboy, Charlotte Brändström, Episode Clips, Episode Reviews/Recaps, Gary Young, James Allenby-Kirk, Karen Campbell, Keith Fleming, Lauren Lyle, Nick Fletcher, Official Photos, Sam Heughan, Season Three, Shannon Goss, Turtle Soup, Uncharted, Victoria Leporia by Amanda Cain. Bookmark the permalink.